ABUJA (Reuters) - Ivory Coast accused its West African neighbours on Friday of profiting from its civil war and refusing to rally behind President Laurent Gbagbo, souring the atmosphere ahead of an African Union summit on Sunday. The country's African Integration Minister Theodore Mel Eg said there was a "lack of solidarity" in the region to help end the crisis in the world's top cocoa grower -- split in half since a civil war grew out of a failed coup in 2002. "There is a war economy which is developing and which profits countries in the region," he told reporters on the sidelines of pre-summit meetings in Nigeria's capital. Long West Africa's economic powerhouse attracting millions of migrant workers from its poorer neighbours, Ivory Coast represents roughly 40 percent of the combined gross domestic product of the region's CFA franc economic zone. But relations with northern neighbours Burkina Faso and Mali have soured. 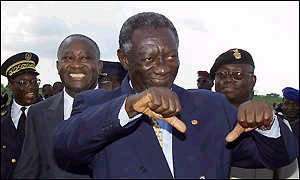 Gbagbo has accused them of backing the rebels who seized the country's north after the failed putsch against him. And many of Ivory Coast's fellow West African states have seen a pick-up in economic activity since war erupted in what was once the jewel in the crown of France's former colonies. Neighbouring Ghana and nearby Togo -- both on the sea unlike landlocked Mali and Burkina Faso -- have had a boom in exports of commodities such as cocoa, cotton and cashew nuts that were previously shipped from Ivory Coast's two ports. Ghana, the world's second biggest cocoa producer, reaped a record harvest last year after an estimated 150,000 tonnes of beans were smuggled across the border from Ivory Coast. Some cocoa has also been illegally exported through Burkina and Guinea -- neither of them known as cocoa producers. In Senegal's capital Dakar, real estate prices have soared in the past two years as international organisations have moved regional headquarters, and their expatriate workers, there from Ivory Coast's main city Abidjan. Mel Eg singled out trade in coffee and cotton -- both grown in Ivory Coast's rebel-held north -- as two of the areas in which the country was losing out to its neighbours. Ivory Coast is Africa's biggest exporter of robusta coffee. While Gbagbo has at times appeared isolated among his African peers since the start of the crisis, his neighbours -- including those generally regarded as his foes -- have always said they would not want to see Ivory Coast collapse. Their argument has been that Ivory Coast's disintegration would have serious repercussions for the entire region. The crisis in Ivory Coast has meant that some countries, Burkina Faso and Mali in particular, have had to repatriate hundreds of thousands of migrant workers who were being harassed because they were seen as pro-rebel, cutting the amounts of cash sent home to poor relatives in those countries. Most countries in the region are also struggling to cope with increased economic activity because they do not have port, rail and road infrastructures to match those of Ivory Coast. An Abidjan-based port official told Reuters this week that Ghana's port of Tema was overwhelmed by the huge rise in the number of ships docking there, and that vessels often had to wait for weeks before they could enter the port.